Last week, the University of Tokyo's Institute for Cosmic Ray Research (ICRR) announced the near completion of full-scale reconstruction work on its giant Super-Kamiokande underground neutrino detection facility, which was severely damaged in a 2001 accident. Super-Kamiokande, the world�s largest facility of its kind, detects neutrinos as they pass through the 50,000 tons of water held in its cylindrical water tank, which measures 39 meters (128 feet) in diameter and 42 meters (138 feet) in depth and is located 1 km underground. 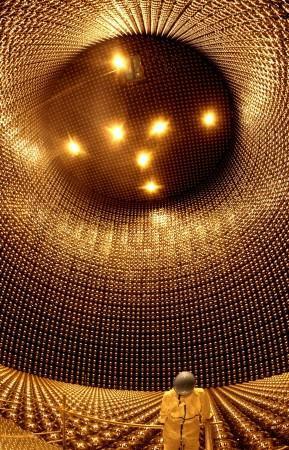 Solar neutrino measurements will resume when the tank is refilled with water at the end of June. About 7,000 of the facility�s 11,000 neutrino-detecting photomultiplier tubes, which are shaped like 50-centimeter diameter light bulbs, were destroyed in 2001 when a chain reaction of implosions occurred after one of the tubes failed. Neatorama » Blog Archive » Super Kamiokande Back in Action.